J.Crew’s Spring/Summer 2013 collection happens to contain this fabulous cashmere sweater plastered with the word “Darling” across the front. The thought of heather gray cashmere and bright pink scribble puts this covet-worthy sweater at the top of my “to want” list! If you like flowers and all things floral, spring is your season. Are there are no shortage of items on the market for those that beautify themselves and their home with blooms. Here’s a smattering of fun apparel items and accessories, as well as home decor and more. 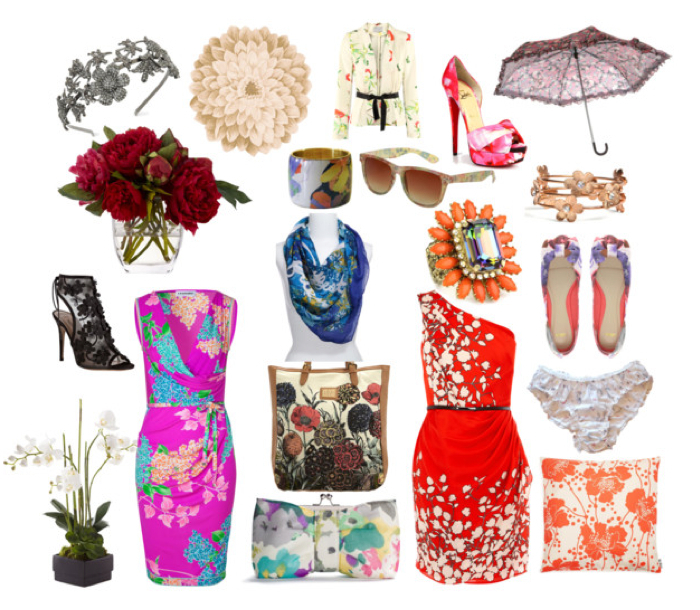 And if something, strikes your fancy, find out where to procure it on Polyvore.com! Ella Moss’ spring collection has a lot of easy knits and cotton, perfect for this stay-at-home mom’s laid back wardrobe. It’s time for the trench. While the calendar is inching towards Spring, our temperatures have dropped to insanely low depths (it’s 7 degrees at 11:17 a.m. in bright sunlight!) But I had already been accosted by Spring Fever weeks ago, so it only seems fair to be looking for that cute trench coat in a neutral color (what color isn’t these days?!). Ideeli landed in my mailbox this morning, as usual, and brought me this adorable, David Bitton trench with an even more adorable ruffled hem and shirring at the back waist. The best part: it comes in navy too. Holla!